6 nights deluxe accommodations in a 1-bedroom luxury cabin. A Bed Of Roses to greet you on arrival. Candlelight Dinner for Two. This romantic dinner starts off with a pair of garden salads with your choice of dressings, followed by a main course of two Rib Eye Steaks (grill them to your taste), two loaded potatoes, fresh homemade bread, plus a bottle of non-alcoholic sparkling grape juice. Finish with a strawberry short cake desert. The table is set with placemats, napkins, flowers and candles with a pair of candleholders you can keep as a memento (Other tableware items belong to the cabin owner and must stay behind). Mountain Breakfast with orange juice, milk, coffee, sugar, cream, eggs, bacon, pancake mix, maple syrup, loaf of banana nut bread and fresh fruit. Smoky Mountain Picnic Basket with Meat & Cheese Tray that includes a selection of roast beef, turkey, and ham, plus slices of Swiss and American cheese. Also includes a sliced loaf of Honey Wheatberry bread, lettuce, tomato, pickles, mayo and mustard to make sandwiches. Want more? We also include Pringles potato chips, a selection of chocolate chip cookies, a bowl of homemade pasta salad and potato salad, plus assorted fruit. To drink, have a bottle of sparkling grape juice and two wine glasses. The basket includes everything you need, including plates, forks, knives, a tablecloth and napkins. We've been told this is enough for two picnics or several late night snacks!! Enjoy. Choose any 1-bedroom cabin for your stay. 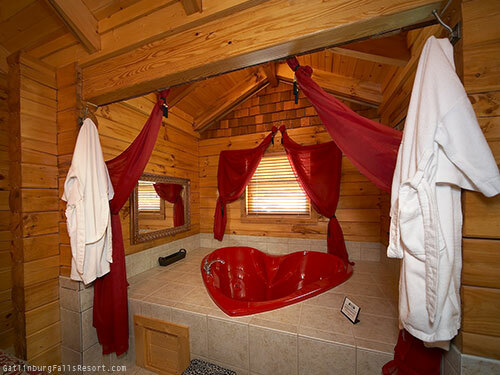 Whether you want sweeping, romantic views, a secluded cabin in the woods, a hot tub or heart-shaped tub, or other special amenity, we have a wide selection of cabins to choose from.